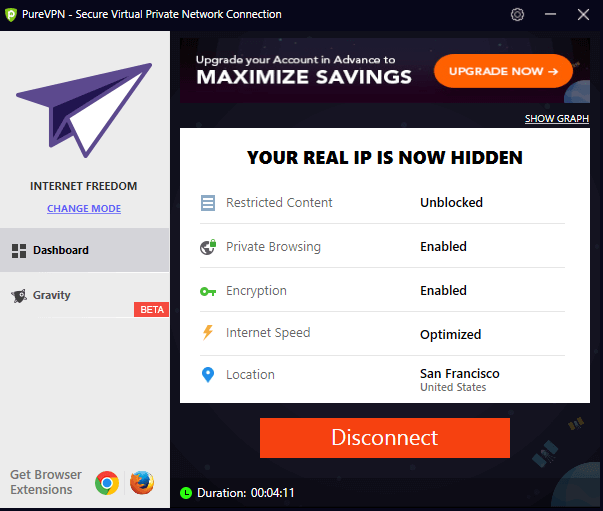 PureVPN is yet another VPN service provider that boasts fast speeds. But not all VPN providers boast a customer base of 3 million+ users. Read on to learn about how this VPN provider became such a hit. PureVPN boasts being “The World’s Fastest VPN Service.” That’s quite the accolade. And maybe there’s some truth to it. They do have over three million users spanning the globe. If their users formed a country they would be the 136th most populous nation in the world. Needless to say, our interest was sparked. So we tested their service to figure out if they’re just a slogan or a leading VPN. If you want to stream geo-restricted content from around the world then this is something to note. PureVPN only allows you to access Netflix on US servers. While this may help users outside of the United States, it certainly doesn’t help those within it. Plus, a single country’s streaming choices run dry pretty quickly. Considering how many servers PureVPN sports we’re a bit discouraged. Although it is important to remember that many VPN services fail to offer streaming. That’s why we’ve compiled a list of the best VPNs that can unblock Netflix. Although PureVPN lacks Netflix access torrent addicts can rejoice. PureVPN has no restrictions when it comes to accessing P2P connections. And that’s great news. Many VPN companies have started retracting torrent access. Or they’ve simply stopped making updates regarding torrenting. Which is never an assuring sign. But PureVPN continues to march forward, allowing torrents without restrictions. Not only do they allow torrenting but they allow unlimited torrenting on all of their servers. 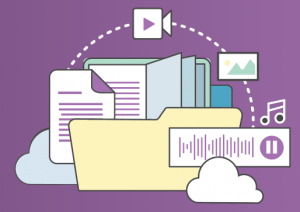 However, their speeds are not always reliable – if you’re concerned about that, check out our top recommendations for torrent-friendly VPNs. PureVPN offers three subscriptions to choose between. All offer the same features. The only difference being the price which depends on the length of the subscription. Know that there is no free trial. So, the lowest subscription plan—and the cheapest chance to try PureVPN—costs $10.95 per month. It’s a bit pricey. If you decide to go all in and save a few dollars then pick up the one-year subscription. It costs $64.95, or $5.41 per month. If you want to splurge out, then there’s the two-year subscription. It costs $3.54 per month or $84.96 in total. That’s only $20 for another year! But wait – there’s more! 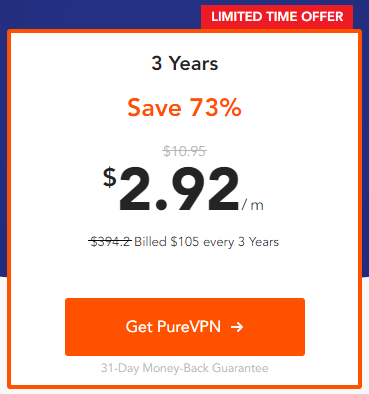 We have an exclusive deal with PureVPN where you can sign up for a 3-year plan for $2.92 per month. The total comes out to $105. Of course, there’s a plan specifically designed for businesses. And is aptly named BusinessVPN, costing $8.00 per month. Larger companies can also contact PureVPN if they would like a plan that suits their needs. Let’s imagine you decided to pick up a two-year subscription. But after two weeks you decide it’s no longer for you. Can you get a refund? PureVPN offers a 31-day money-back guarantee on all their plans. So long as you haven’t exceeded 31 days after purchasing their product you qualify for a refund. There is no catch. As they put it, it’s a “No Questions Asked, Risk-Free, Stress-Free, 31-Day Refund Policy”. PureVPN can be paid for with nearly every payment method invented. 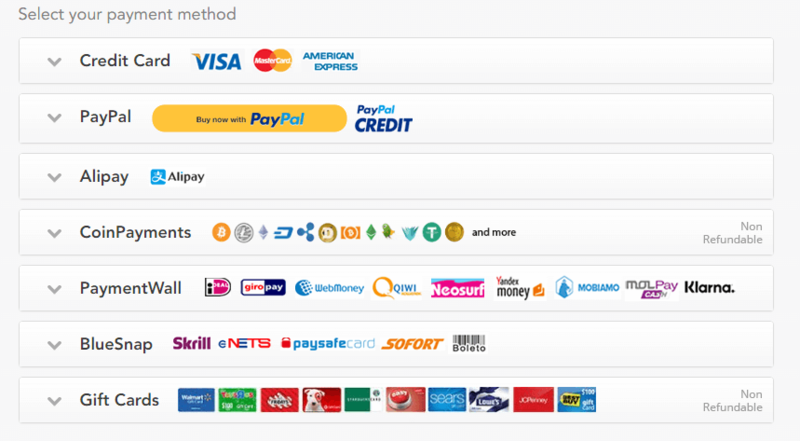 You can pay for your subscription using Credit Card, Paypal, Alipay, or Coin Payment (crypto). We can call these the standard payment methods. You can also choose to use Paymentwall, Bluesnap, or Gift cards! Techies rejoice! 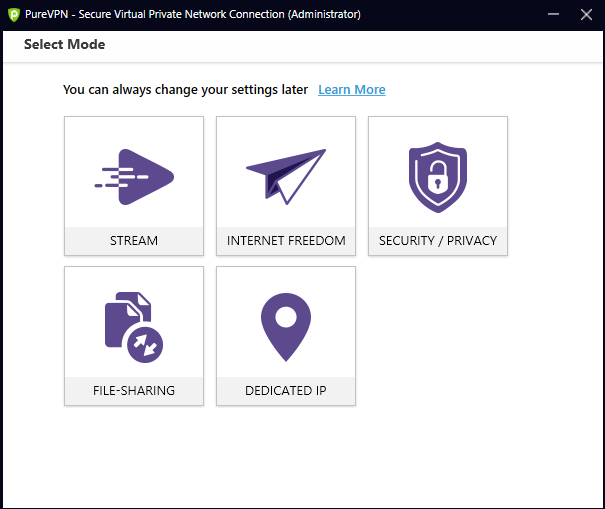 PureVPN is available for all major platforms like Windows, MacOS, iOS, Android, Linux, and Routers. But that’s not all. The VPN has expanded their reach to platforms like smart TVs, gaming consoles, and even browser extensions! Plus, you can connect up to 5 devices simultaneously so you’re sure that, at most, five of your devices can stay protected! 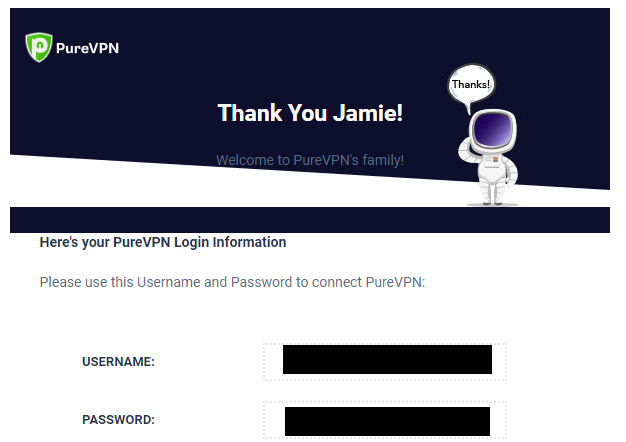 Signing up for PureVPN is simple. Just pick the plan you want to subscribe to. Then choose your preferred payment method. And simply input your details: name, email address, and payment information. After you’ve entered your information a popup box will appear which is followed to complete the transaction. If the popup window fails to appear, make sure you don’t have any adblockers enabled. Simply unblock pop-ups for the PureVPN website to complete your transaction. When you’re all set you’ll receive a welcome email from PureVPN. Your page should then reload. And you’ll be directed to a new screen. 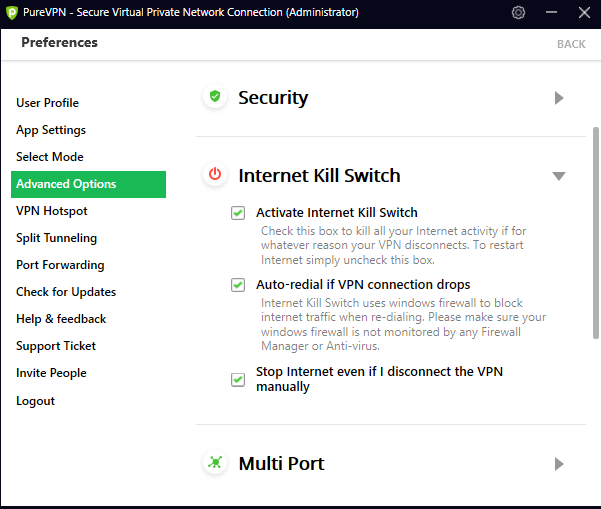 This new screen is a step-by-step guide to downloading and connecting the VPN. Use your information from the first step to sign in. On the next screen pick the client suitable for your device. PureVPN also provides a setup guide if you need assistance installing the service. PureVPN goes the extra step by asking if you’ve successfully connected to a server. If your answer is “No,” the VPN prompts you to contact their support team for assistance. We’ve got to say, PureVPN has a really cute and user-friendly interface! Simply log in using the VPN credentials given to you. Once logged in you’ll have to pick which mode you prefer. The modes are designed to give you the best possible experience depending on what you want to do. After choosing you’ll be directed to this page where you can select which server you want to connect to. If you ever want to configure the application simply click the settings icon in the top right corner of the app. That will lead you to the preferences page. PureVPN offers live chat, a ticket system, or you can reach out to the support team through social media. Of course, connecting through live chat is the most convenient. Contrary to what some users have reported we had a pleasant experience contacting support. The response was quick. And helpful. PureVPN is also open to suggestions. They feature a page solely for users to post ideas and feedback. If you have questions regarding PureVPN’s service then you can utilize the Knowledge Base and FAQ page. It answers the most basic and common concerns that users might encounter. The FAQ helps you troubleshoot, and even teaches you to use the service. The page also answers questions regarding billing, account upgrades, and questions you may have before making a purchase. It’s definitely a lot of helpful information! If there was “who has more servers” rumble contest between VPNs, then PureVPN would surely be a top contender. The service flexes with over 2,000 servers across 150 countries. Subscribers to PureVPN should have no problem connecting to whatever region they fancy. Users have claimed that their DNS address has leaked a few times while using PureVPN. Hearing about these leaks made us a bit worried before testing. We’re happy to report we didn’t have any leaks when we tried PureVPN. Whether they’ve had leaks in the past remains to be a question in the past. Today, there are zero leaks. PureVPN uses a top-notch military grade 256-bit encryption. It’s the best that money can buy. In addition to this, they also have an extra added layer of security called Ozone. Ozone is comprised of five features: Antivirus, IDS/IPS, URL Filtering, Content Filtering, and App Blocker. These help users remain protected against incoming threats, filter unwanted web content, and control which websites and applications are allowed to run. 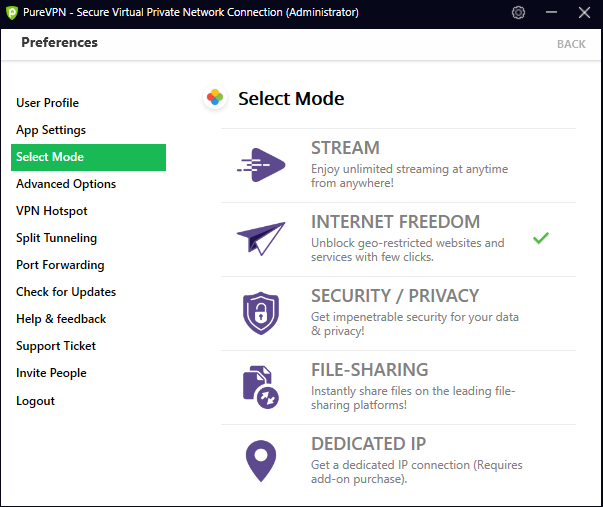 If you’re not satisfied, PureVPN also has five separate add-on features that you can purchase along with your VPN. That being a Post-forwarding add-on, Dedicated IP add-on, Dedicated IP with DDoS protection add-on, Enterprise-Grade Security add-on, and a P2P protection add-on. All of which are designed to keep you extra safe on the internet! For protocols, they offer OpenVPN: the leading open-source protocol used by millions. But if you want to switch it up depending on your device PureVPN also has SSTP, L2TP, PPTP, IkeV2, and Stealth VPN. On top of their great security, PureVPN also has a built-in kill switch to ensure your safety at all times. You never want to be at risk if your connection drops. “The world’s fastest speeds” must be referring to a different planet. With this kind of slogan, we were prepared to put PureVPN in our best VPN list. When we ran our tests PureVPN was a bit of a disappointment. Some servers delivered fine enough speed. But others were terribly slow. We didn’t find any consistency. And that’s something to consider, especially if you want stable speeds. This is one indication that your speeds may fall over time. PureVPN states that they have a “No Logging” policy. But we’ve learned this isn’t always true. The service doesn’t log your origin IP address, assigned VPN IP address, VPN session timestamp, browsing activities, or DNS requests. However, they do keep track of the specific day that you connected to a VPN server. Along with the internet service provider you used to connect. Although they offer unlimited bandwidth access they still keep track of the total amount of bandwidth you’ve used up. This data is apparently to detect users who may use up “unnatural amount of bandwidth” that may cause disruptions in the service. PureVPN also collects analytics from third parties that you might have used, like Google, iTunes, Facebook, New Relic, and others. That also includes emails, live chat and feedback forms which are all used to better your experience. Despite what PureVPN claims, they have played a crucial part in the arrest of one U.S. citizen according to a sworn affidavit. Their claims aside, PureVPN has helped the U.S. government catch a criminal on the charges of cyberstalking. So their logging policy is definitely questionable. They also stated that they have evolved their policies to comply with GDPR. Nothing to report here! 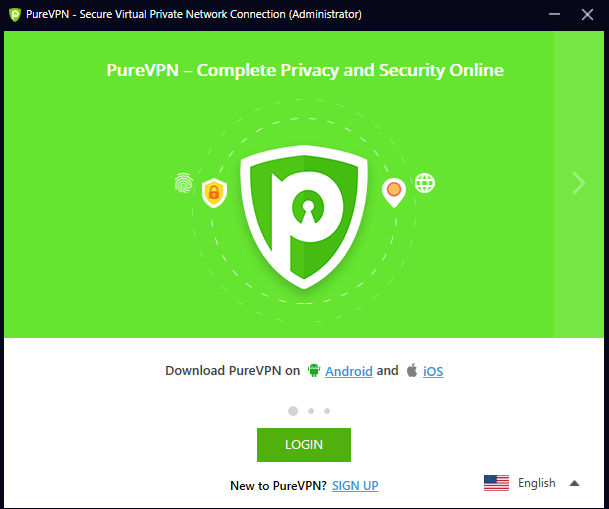 PureVPN is a solid VPN service. PureVPN is based in Hong Kong. It actually began as an experiment in 2006 by the founders, GZ Systems. PureVPN began its service with servers in just two locations in 2007. And continued to grow the same year until it spanned 16 different locations. 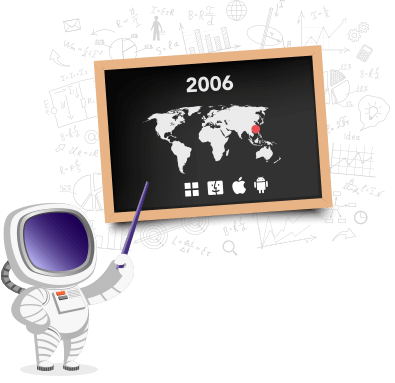 In 2009, the company expanded its server locations and they introduced their first client software for Windows and MacOS. It was followed by an Android and iOS app in 2011. By 2013, PureVPN improved their services and added new features. Which eventually resulted in them having over three million users today. With all of those users, it’s no surprise that they have an estimated annual revenue of $15.7 Million. In the past, PureVPN has been mixed up in some bad press – mostly due to their business practices. Practices such as faking user interaction on their website, sharing customer information with the U.S. government, and broken security features. Since PureVPN is headquartered in Hong Kong meaning they do not fall under Five Eyes jurisdiction. There is a Five, Nine, and Fourteen Eyes alliances which are a group of countries that agreed to collect and share user data. If you’re using a VPN that logs your information—and has agreed to work with the government—one court order could compromise your data. That’s why it’s important to understand the logging policy and jurisdiction of the VPN you’re using. There’s no arguing that PureVPN’s security is as strong as the Hulk. And their user-friendly interface makes it easy for users to navigate through the application and configure it. They’ve got great customer support and a knowledge base page that helps users with their concerns. Plus, unlimited torrenting is a huge plus! In the past there were reports of DNS leaks, but today there should be no issues. Don’t worry about putting yourself at risk with PureVPN in terms of leaks. Their speed isn’t exactly stellar, but the biggest red flag is the fact that they handed over customer data to the U.S. government. But all in all, PureVPN is good if you are not committing any crimes. Although we have to say that you can get your money’s worth with other VPNs like the ones we picked for our top 10 list!